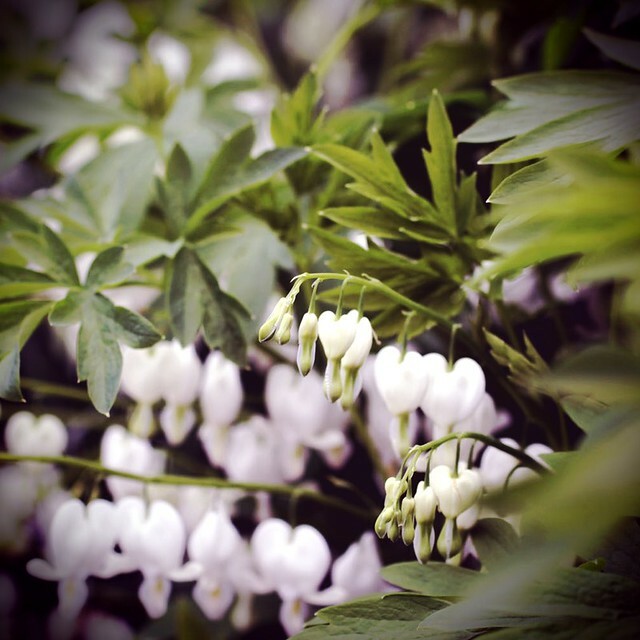 As I've been sorting through and attempting to catalog the 10,827 images in my iPhoto from 2010 I came across this picture of white bleeding hearts from March. I reminded me so acutely of a dream I had last night that I had forgotten. In the dream I had gotten off a city bus in a rotten mood. As I was walking home, Nea ran up to me and her legs were broken because she had run so hard chasing the bus I was on. Somehow we continued on together. On our way up a very familiar street I noticed all these giant multi-colored bleeding hearts growing on the side of the road. They were enormous like marshmallows! It was like I was in flower land in a Mario Bros. game. It was the jackpot dream!!! I picked armloads of them. Wow, I'm so happy I just remembered that. We made flowers for 74 weddings in 2010! Some were city hall bouquets, others were grand productions requiring a staff of ten. I couldn't choose which I like better (though my bookkeeper might). I will tell you I learned a lot about flowers, a lot about business. Learned how to be a boss. Learned how to start taking my work a little bit more seriously sometimes, and learned to take the small quibs and quabbles along the way a lot less seriously. Learned a lot about what types of jobs I want to do, and what types I don't. Learned I don't want to work in carpeted ballrooms anymore, or in the hottest weeks of July and August. I do want to work on more small backyard weddings. I do want to grow zinnias and celosias, and forage more of the material we use in the studio. I want to find a way to compost our flower waste. I want to make serious time for myself to take care of myself. And by take care of myself I mean get a massage. Every week. I would like to make flowers for an event at The New York Public Library. And...I would like to have more time to pay attention to soap; the workhorse, the backbone of this little business. I have so much to learn still and so much flower research to keep up with. Hellebore festivals to attend. Primroses to source. And I still need to share with you our search for the Icelandic poppy! In order to make room for all these things in 2011, I'm cutting back our wedding/events schedule dramatically*. Not sure how we're going to make the paper that keeps payroll going but we'll cross that bridge when we get to it. Get ready because you haven't seen anything yet..
*Going to keep the Just Because Initiative running every Thursday though because it's just too much fun. I've taken a few weeks off around the holidays, but I'll be posting the first flower giveaway of the year this Thursday, January 6th. In the hopes that Marky Mark will enter, win and answer the door shirtless when we deliver his flowers. Dayum! Sounds like one hell of a year! Amazing how growth (the thing everyone longs for) can also be a HUGE burden if left to run wild. Once you've experienced the bitterness of burnout it's so much easier to set limits and begin to occasionally say "no". Wishing you Balance in 2011! What an interesting dream. My grandma used to grow bleeding hearts. I always thought they were so poetic. 2010 was a heck of a year for you. I must say, it has been a lot of fun to watch and read about. I'm sure you will make 2011 even better. can't wait! and hellebore festival??? where? sign me up. Everything you said really hits home for me this year too. I still work out of our home studio (dining room and garage actually), and I think 2011 is the year to move all the mess out to a real studio... Much luck to you and Eric and Nea in figuring it all out - I look forward to reading about it! In that case you might be giving Markey Mark a little more than the flowers....I would!